“Knowledge-Based Trust” (KBT): Google aims to give us the facts. (Originally posted on Activating TOK) Who needs critical thinking when we have Google? A team of computer scientists working for Google has proposed an improvement on what comes up when we enter our terms in its search window. 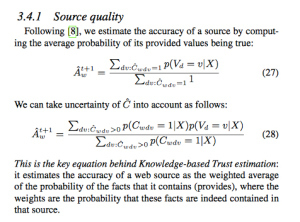 They suggest a method of calculating a “trustworthiness score” for webpages based on their factual content: “We call the trustworthiness score we computed Knowledge-Based Trust (KBT).” An avid Googler myself, I am awash with both admiration and amusement. What would our students, many of them also consummate Googlers in face of essay assignments, make of the knowledge questions that instantly arise about the nature of facts, truth, and reliable sources? The proposed system, explained briefly in New Scientist (“Google wants to rank websites based on facts not links”) pushes web sources up the Google rankings no longer by counting the number of links to it within the interconnected Web, but instead by internally checking its facts and bumping down the “trustworthiness score” of those pages whose information contradicts what is otherwise established within the web. But how can Google rate the factual accuracy of the information and knowledge claims of websites? 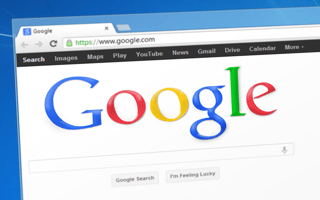 Google doesn’t do independent research, nor does it have a method of establishing a Reliable Source independent of the knowledge claims repeated throughout the internet. To what extent will you grant Google your own KBT (Knowledge-Based Trust)? 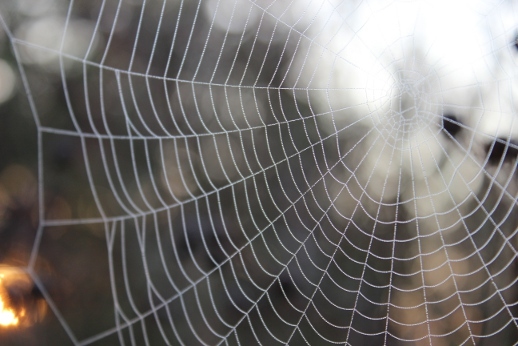 We can imagine the vast compilation of electronic information using many different metaphors: the web, the Vault, or a self-contained bubble, for instance. Perhaps the metaphor (TOK language) we choose might affect what knowledge questions we pose about the Google measure of trustworthiness – and using the metaphor of “an echo chamber” ought to provoke a few! If all sources agree on information, is it true? If the information provided by a minority of sources contradicts the information provided by the majority, is it false? Is the probability of accuracy of a source reliably measured by the degree of accord with other sources? Are all sources of information equally reliable? Why or why not? Do all websites contribute equally to accurate understanding of an issue? What is an “expert”? To what extent do our expectations of an expert source vary according to the area of expertise? If a source is expert on one topic, is that same source necessarily reliable on unrelated topics? As students are likely to point out, we should choose whom we ask depending on the topic, and we should weight our trust according to the knowledge of our sources. If we want to know whether a medical procedure is safe, we should turn to doctors, not to a democratic vote of our friends. We’d be wise, similarly, to listen to the consensus of climate scientists regarding climate change rather than looking for the most frequent assertions in the media. To what extent can we evaluate the trustworthiness of a source by the trustworthiness of its information? To what extent can we evaluate the trustworthiness of information by the trustworthiness of its source? Can we simultaneously evaluate the quality of the source according to the accuracy its information, and the accuracy of the information according to its quality of the source? Am I being unfair to Google? I fear I may have missed something truly significant in this proposal to change the methods of a Google search. I certainly don’t understand all the supporting methodology – and I encourage you to try to read the equations and diagrams yourself. This is not my field! I would welcome response from someone more knowledgeable to comment on my comments and what I’ve missed. Altogether, though, I’m left with appreciation of what the Google aims to do in making this change. If it moves away from ranking websites on a search according to how many other sites refer to them with links, it moves away from ranking by popularity – popularity that can be gained through reasons that have nothing whatever to do with reliability. I’m concerned, though, that what it takes on in ranking for reliability is much more complex and may create trust – KBT! — that has a shaky foundation. And so, despite my appreciation of Google’s goals, I’m also left with an even greater appreciation of what eludes data collection by bots and internal analysis by algorithms: that is, critical thinking and human judgment. We can be glad to have better information come up on a Google search, but we’ll still want to do the critical processing ourselves as we tackle a knowledge question that is extremely important within IB Theory of Knowledge and relevant to student research within the entire IB Diploma: How can we best determine the likelihood of a source being trustworthy?